Two-and-a-half years after declaring independence from Georgia, Abkhazia still exists in a state of limbo. It is 2:00 pm in the Abkhaz city of Gali, and a dozen men are eating in a small bar next to the old theater. “Now we have to say that we are Abkhazians, and so we do,” said the men, but ethnically they are Mingrelians, refugees of the successive armed conflicts between Abkhazia and Georgia. Mingrelians make up the majority of the more than 50,000 people who have returned to Gali in the past few years. Those with passports may work, but only around 5,000 Mingrelians have one. Before the latest elections, Abkhaz President Sergei Bagapsh proposed amending the law to provide passports to Georgians from Gali, but Bagapsh changed his mind after he was faced with accusations of treason and the possibility of losing to the nationalist candidate in the vote. Recently, the Abkhaz statistics office published new census results. According to the government, 242,826 people live in the self-proclaimed independent region, meaning that the population has increased by nearly 30,000 people in the past seven years. In contrast, the International Crisis Group, a think tank, estimates the population to be under 200,000. “The difference in numbers is because many inhabitants of Gali do not have an Abkhaz passport and are not even registered. Many of them travel back and forth between Gali and the neighboring region of Zugdidi, while others don’t even have the ‘document #9,’ which in practice serves as a residency card,” said an expert from an international agency in the region, who asked to remain anonymous. Barely 30,000 people are officially registered in the border region of Gali, although the government recognizes the presence of 65,000 refugees, while international organizations put it at 45,000. “We do not deny people from Gali go to neighboring Zugdidi, but a system needs to be put in place to regulate border crossing,” President Bagapsh said. 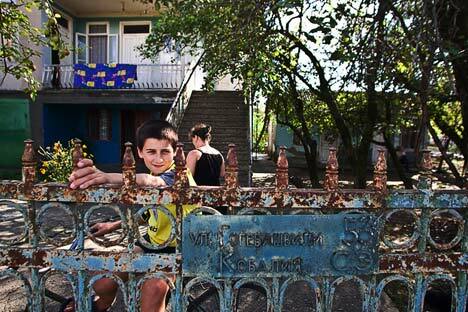 “Many people have not wanted to leave and many return because they consider it [Zugdidi] to be their home. The majority returned immediately after the war, resulting in very few conflicts over property, although many upon returning found their homes to have been burned down,” said Salikhova. Kobalia’s daughters, sons-in-law and grandchildren live in a similar cabin next to his. “Where will I go? My home and my family are here. What will I do in Georgia? I have no property, I wouldn’t be able to survive,” Kobalia said. The Inguri River valley forms the “administrative border” between Tbilisi and Sukhumi. Russian troops are on one side of the bridge and Georgian troops on the other. On the Georgian side, a poster of Mikhail Saakashvili shows the Georgian president with a map of the country; across the valley, a billboard shows President Bagapsh and Russian President Dmitry Medvedev shaking hands. Currently, Russia supplies Abkhazia with more than 80 percent of its foreign investment and 90 percent of its imports. Russian rubles are accepted there and phone numbers begin with the +7 international country code assigned to Russia. Abkhaz Minister of Economics Kristina Özgan says that Moscow provides 57 percent of the government’s entire annual budget. For 2011, Moscow has awarded a 2 billion ruble loan ($67 million) to the Abkhaz government for the purpose of rebuilding its railways. The aid is part of Moscow’s strategy to pacify the region by developing tourism. The 2014 Olympic Games in Sochi are not far off, and the first measures for fostering the tourist industry have already been implemented in Vladikavkaz. Russia has allocated 10 billion rubles (250 million euros) to improve communications in Abkhazia; regular flights between Sukhumi and Moscow have already been established; and Abkhaz citizens may obtain a Russian passport to travel abroad. In addition, the Abkhaz government has come to an agreement with Russian oil major Rosneft to begin oil exploration in the region’s territorial waters. Gazprom and Lukoil have also expressed interest in the project, which hopes to strike oil, manage its extraction and construct refineries over a 10-year period. The first disputes between Abkhazia and its patron have arisen, however, with the request that Sukhumi limit Russian investment in the real estate sector and in establishing borders, because Moscow is insisting on absorbing the town of Aibga—population 127, located in the mountains next to the Psou River—as a condition for recognizing the border. “The honeymoon between Moscow and Sukhumi is over. The Abkhaz people and authorities still very highly value Russian support, but the Kremlin’s support, of course, is neither free nor a charitable act. There are tensions that show that relations between Moscow and Sukhum are complicated and Abkhazia is not a simple Russian puppet,” said one international analyst.